The communications team at Audi India tells us that the current A4 is selling in exceptionally good numbers, despite its age. It is not hard to see why. It is still one of the most value for money offerings in its segment. It has bravely soldiered on for eight years with its fair share of facelifts and equipment upgrades. But a replacement was overdue. They had shown us the all-new A4 (code named the B9) at this year's Auto Expo. If you have seen it already, let me assure you that I was wondering if it is indeed a generation change or just another re-skin job. So I was recently flown to Munich to drive the Euro-spec car and get my answer. In its appearance, it still doesn't come across as an all-new car. Its silhouette is similar to the current model - thanks to the same height. But park the two next to each other and you will realise that new car is marginally longer and wider. The sculpting of the bodywork is edgier now for a more sharper design theme that is in-line with the newer Audis. The headlamps look great with their chiseled cuts and double row of LED DRLs. They can also be spec-ed with the matrix lamps. The single-piece grille isn't as imposing as in some of the larger Audis but attracts plenty of attention and is wider than its counterpart on the outgoing model. A notable design highlight is the deep shoulder line that meets the front of the car to become the shut line for the bonnet - much like the new Superb. The bonnet itself now gets four prominent creases instead of the previous two, and that gives the fascia a more aggressive, frowning look. The tail lights are sleeker like the ones on the A3, but I would have preferred more design distinction for this all-important sedan. The wheel arches are a bit more flared, but the alloys are the real highlight for the new designs they have on offer. The mirrors have been redesigned too. They are now sleeker and have contours around the stalk to reduce wind noise at high speeds. Step inside and you could be astonished by the cabin or be a tad disappointed. Though the latter won't be a common reaction, it could be justified. Compared to something like the new C-Class, which was a major departure from its previous model, the A4's cabin seems like a minor evolution over the outgoing car. On the other hand, it could also wow you because of how clean and well-appointed the fascia looks despite having plenty of switches. Their switchgear for the HVAC controls has a nice tactile feel to it, while the rotary dials have a integrated displays for the temperature read-out. It isn't the first time we have seen such an arrangement, but it does go well with the cabin's new-age approach. Like all new Audis and VWs, the dash also gets A/C vents running across the length of the fascia. The highlight of the cabin, however, has to be the TFT instrumentation. 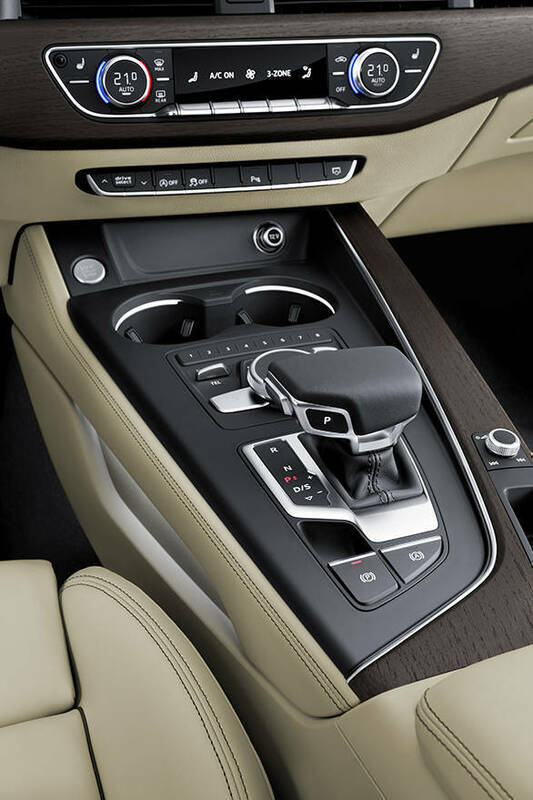 We have already seen it on the TT and the Q7, but for those who don't know, the instrumentation uses a digital display panel instead of analogue clocks. It is, therefore, customisable to show a multitude of information, including detailed satellite navigation. It is complemented further by a head-up display for quick info on speed and turn-by-turn navigation instructions. The TFT instrumentation is a good USP for the car, and we hope that Audi makes it a standard fitment across the range. 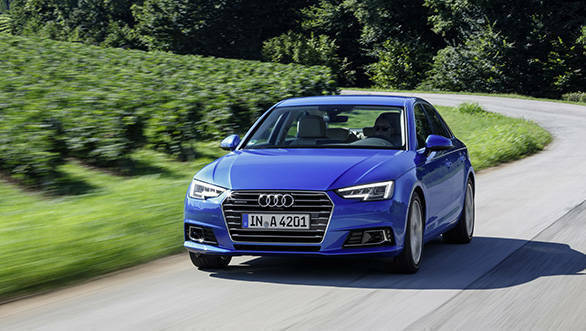 Since the A3 now has the duty of luring new customers to the brand, the A4 has concentrated on growing larger and even attracting the chauffeur-driven clientele. In the last generations of the C, 3 and A4, the Audi still had one of the best rear seat space, but the new one is even better. Audi claims that the rear legroom is up by 23mm. A generously sized person like me didn't have any space-related complaints in the back seat. Even with the front seat retracted backwards completely, I still had about an inch between my knees and the scooped backside of the front seats. With the fairly extended roof, there is plenty of vertical and horizontal headroom. Add to it the large windows, and the A4's rear bench won't feel claustrophobic even on longer journeys. The seats are nicely contoured too. Under-thigh support is adequate at the front and at the back. The rear seats are good for two adults and a small kid. Our test car's seats were wrapped in leather and the doors got matching alcantara trim as a part of the S-line package. The lower variants were clad in fabric upholstery, but the India-spec car will get leather on all trims. Under the skin is the all new MLB2/MLB EVO platform. Like the new Q7, the A4 too shaves off a lot of weight with the new platform architecture. 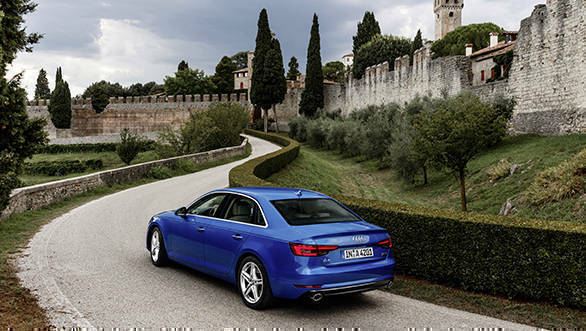 Through the chassis, drivetrain, seats and body panels, the A4 drops up to 120kg depending on the variant. The car we drove was the range-topping 3.0-litre V6 diesel with the quattro drivetrain. It is highly likely that this will be the range-topper in India too, marking the return of the quattro badge to the A4's Indian lineup. It could be offered in a single trim level only when Audi's plans for India are finalised. The engine is very refined and makes a healthy 272PS of power and an equally impressive 600Nm of torque. Despite that, Audi claims that the car can achieve a fuel economy of over 20kmpl and an overall CO2 emission rating of 129g/km. The meaty torque spread is the key here as the car can happily cruise at triple digit speeds with effortless engine speeds. The engine is mated to a torque converter with an 8-speed tip-tronic function. The shifts are smooth and quick enough for highway and city use. Around the twisties, you are better off with the paddle shifters. Roll-on acceleration is quite impressive too, and Audi claims a 0-100kmph sprint time of 5.3s. If given a road like the Autobahn, it can quickly reach its electronically restricted top whack of 250kmph. But at those speeds, our car felt a little floaty despite the four-wheel torque vectoring. At speeds close to 200kmph, the A4 felt more grounded. A common feedback with the current A4 has been on the steering setup. Though conveniently light in the city, it feels a tad lifeless at speed. The new car addresses that issue. The steering seems to have gained a bit of weight at lower speeds now and feels more communicative as the speeds rise. It still isn't heavy as the 3er or as chatty as the XE, but it is on par with the more balanced steering setup that we had liked with the new C.
The suspension setup with its multi-link config worked quite well at giving us a smooth ride over the German country roads and the Autobahn. Even over ruts and joints, it performed quite well and quite silent too. Audi assures that it can take on worse, but we think that the Indian roads are a different benchmark altogether, so more on that with a road test. The bread and butter variants of for the A4 will be a 2.0-litre TDI diesel and a likely new 2.0-litre TFSI petrol which will replace the 1.8. The in-line four diesel motor now puts out 190PS of power and 400Nm of torque and chucks the continuously variable transmission (CVT) for a new-age S-Tronic dual clutch transmission. Unfortunately, we couldn't get our hands on either of the 2.0-litre mills, but we'll give you a more detailed view on those with a road test once the India-spec testers reach us. We hope to receive them in a couple of months. 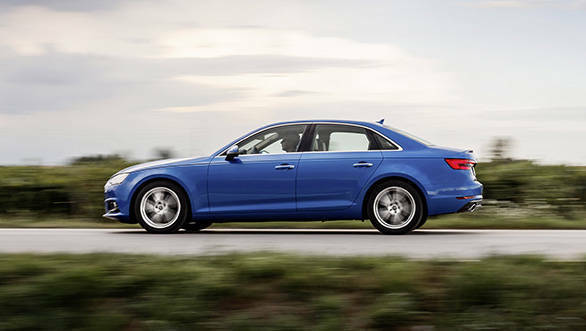 During the Auto Expo, Audi had hinted that the A4 would arrive into India by the end of the year. However, they now say that the demand for the current model has surged unexpectedly, and therefore they would run out of stocks quicker than expected. One of the reasons that triggered the surge is the better level of standard equipment that the car offers over its rivals. The new A4 is looking at that aspect closely too. Since it is a new car, it also comes with a host of new safety features and assistance systems. But one feature that certainly had me hooked was the adaptive cruise control with the traffic jam assist. Irrespective of what speed you set the cruise control to, it has the ability to read speed limit signs, judge the speed of the car in front of you and even use GPS data to regulate the speed for upcoming curves or inclines. In the event of a crawling traffic jam, it can also brake on its own and resume rolling when the vehicle in front of you moves. Most of such systems uses cameras and radars for their operation, and the latter doesn't work in India as most of the radar frequencies conflict with the frequencies used by the military. But someone in the knowledge tells us that a middle ground might have been reached among the military, the ARAI and the carmakers, and these radar based systems could finally make their way into India. As for the A4, its appeal has always been its sensible and matured approach. The new one builds further on it. I still have my reservations about its design inside-out, but there is no denying that under the skin everything has changed and for the better.